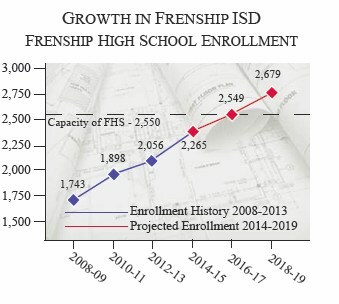 Since 2001, Frenship ISD has witnessed an enrollment growth of more than 3,000 students. With the support of the local community, FISD has opened four new campuses since 2006. Three of the campuses - Oak Ridge Elementary, Heritage Middle School, and the district’s seventh elementary campus opening in 2014 were part of a $128 million bond passed in 2007. Demographic studies and projections show enrollment growth within FISD is expected to continue in the district’s near future. This enrollment growth continues to make its way to Frenship High School, where the campus has an enrollment capacity of 2,550 students.